Every Tuesday, we tweet personal finance tips to help you achieve your financial goals. Click here to follow us on Twitter. Below are tips we tweeted last month. Click on each tip to view the source. Be aware of IRS imposter scams – the IRS will never call and demand immediate payment. Tax Counseling for the Elderly (TCE) program and Volunteer Income Tax Assistance (VITA) program are sponsored by the IRS and provide help with basic tax returns and electronic filing. Before retiring, create a realistic budget that includes home maintenance expenses such as replacement of roof, HVAC, kitchen appliances, and other expensive items. Since you’ve gathered your financial documents to file your taxes, take that next step and develop a comprehensive financial plan. 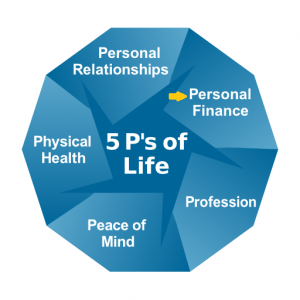 One of the 5 P’s of Life is “Personal Finance” – your money. While money isn’t everything, it helps you achieve the lifestyle you want to live.